Nelson Part of the BC Adventure Network. Over a million web site visitors annually ! Located on the shore of the beautiful West Arm of Kootenay Lake, surrounded by the Selkirk Mountains, Nelson is home to 350 heritage buildings. Nelson's story-book charm with lush parks overflowing with bright flower gardens gives the visitor a sense of relaxation that pervades even the bustling city center. In 1867, gold and silver were found in the area and Nelson grew quickly as a result of the frantic mining activity. 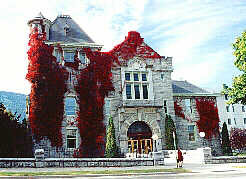 Chateau style civic building were designed, as were lakeside orchards, and the first hydro-electric generating plant in BC. On March 4th, 1897, the City of Nelson was incorporated with a population of 3,000. Today, visitors can ride the restored Streetcar 23 which winds along Nelson's waterfront. This popular attraction along with self-guided heritage walking tours and the Nelson Museum make the community's history come alive. Nelson has consistently been ranked as the number one small town arts community in Canada, by John Villani, who publishes The 100 Best Small Arts Towns in America. Boaters will also enjoy Kootenay Lake, a the lake that as a result of its size, is more like an ocean. In the afternoon, winds channel through the valley providing excellent conditions for sailing. Access: Highways 6 & 3A, airstrip, heliport and float-plane base located 500 m. from city center. Greyhound bus & charter, as well as private service by small aircraft at the Nelson Airport are available. 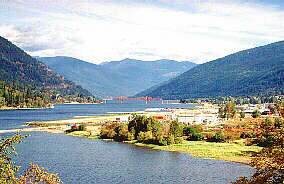 Scheduled domestic air service from Castlegar (30 minutes by road) daily. Accommodations: There are a variety of bed & breakfasts, first-class heritage hotels, comfortable motels and many campsites in Nelson and the surrounding area. The city-run park offers campsites in the downtown area.